You would think living in a small town in the woods you would have plenty of firewood. Apparently people don't enjoy going out in the woods and cutting it up. While I have got wood into smaller vehicles the little SUV Chevy Equinox did a pretty good job taking in half a face cord. 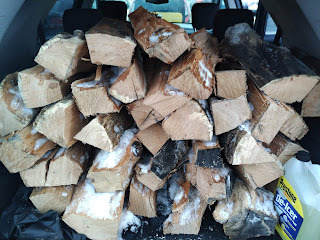 A little more needed to to in the back seat but I did get my wood for the snowy winter! Hauling it to various stashing places around the house I start thinking I'm more of a squirrel hiding nuts than an actual person. You have to sort of think about ease of obtaining as well as how far you have to walk. Sometimes a sled can help but.....without kids in the house....I got none of those. I'm always looking around for more wood anyplace I can get it. It should of course be hardwood as pine burns way too fast. I'm in a place surrounded by trees but not enough firewood.